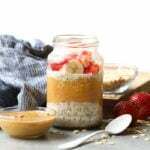 Just when you thought we couldn’t come up with another overnight oat recipe this one slaps yah right in the face. 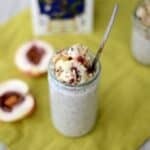 OMG do you know how amazing it would be to take a bath in this oatmeal recipe? Seriously- I bet this stuff would be a great exfoliant. NOTEVENJOKING. Oh, hai Overnight Oat Week Day #5. You’re lookin’ mighty fine. I’ve been a sucker for blueberries lately. It’s been my favorite berry for the past few months…even over strawbs! I can’t wait until it’s the dead of summer and the blueberries are bigger than my face. YAS. Speaking of summer. Does anyone have major summer plans this year? I feel like my calendar is filling up for June-Sept and it’s only April. I’ve got lots of trips to Milwaukee on the books, a few to Chicago, some to up north, and 4 weddings. Weeee summertime cannot come soon enough. This recipe is pure summer to me. The lemon zest you guys. We tested this recipe a couple of times and…. Don’t skimp on it. It really makes the recipe sooooo tasty. Plus then you get to play with your zester (which apparently isn’t a word because there is a red squiggle underneath it). 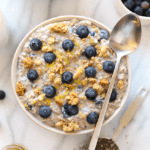 We suggest topping this oatmeal with a sprinkle of your favorite granola so that you get that blueberry muffin crumble. Don’t forget about more bloobs and FRESH LEMON ZEST. Did I mention the lemon zest?